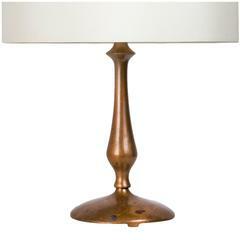 Bronze table lamp. Manufactured in the USA, circa 1980s. Original cord. Custom silk shade. Takes one E27 Edison 75 watt maximum bulb. Bulbs provided as a one time courtesy. Table lamp in bronze with two birds in a tree, on a marble base. A handcrafted Italian bronze column table lamp with an inset geometric pattern designed by Italian designer, Luciano Frigerio. Newly rewired column height is 11.5”.